Updated Monday July 16, 2018 by Pete Rose. 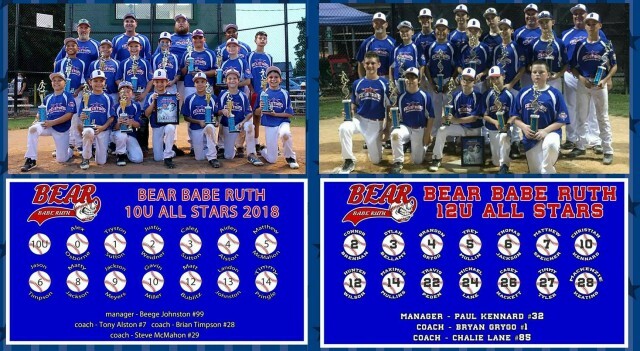 We like to send a big CONGRATULATIONS to our 10U and 12U All Star teams who won the Delaware State Championship for their respective divisions! Both teams are headed to Cal Ripkin Regionals this week to represent the State of Delaware. The 12Us will begin games on July 18th at 12:00 p.m. in Mount Olive, NJ. The 10Us will start their games on July 19th at 1:30 p.m. in South Plainfield, NJ. We would like to thank everyone who has come out to support our teams so far. Join us in wishing them safe travels and good luck next week. Play hard!